Discussion in 'Designers and Collections' started by jacobs, Feb 25, 2009. 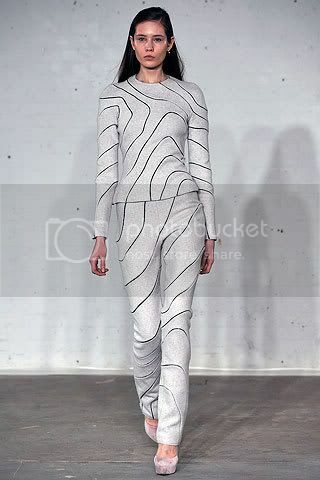 Josh Goot is the third designer in London to mention geology as his inspiration. 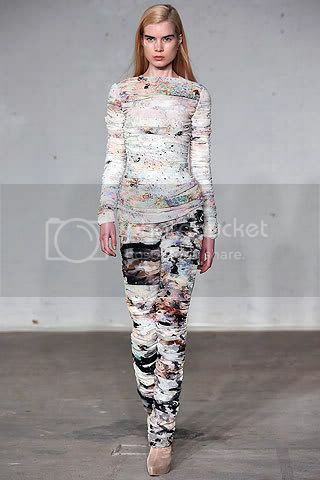 Where Marios Schwab and Graeme Black looked at mineral deposits (as Peter Pilotto did last season), Goot was thinking of "the organic lines of stone, and cutting and chiseling it." 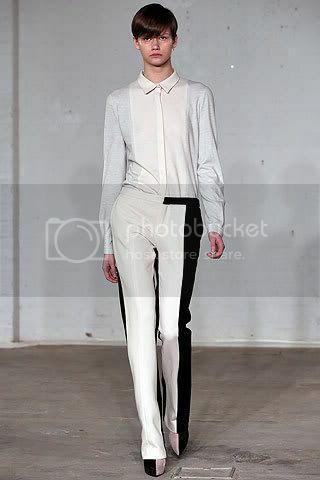 Essentially, the idea led to delicately color-blocked neutral and black tailoring for Fall. 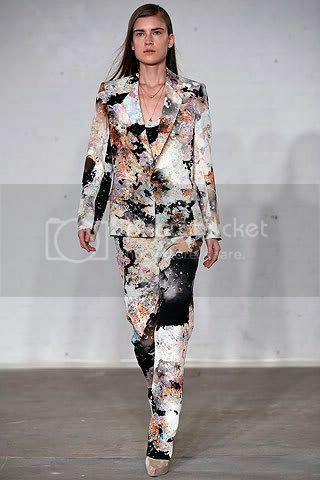 A long section of cream and black jackets, pants, skirts, and dresses were, in some cases, cleverly constructed so that half a jacket was cream and the other black. After that came ripple effects that looked like contour lines on maps. 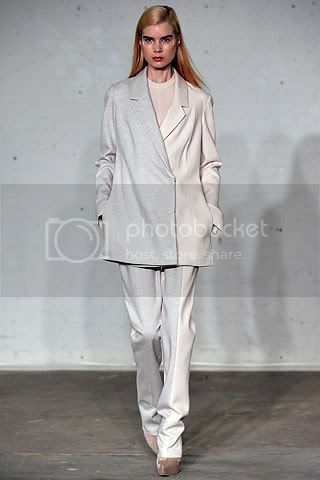 The minimal sportswear look had an urban ease about it, but the audience was waiting for something more: a new representation of the prints that followers are beginning to expect from Goot. They were a long time coming, and attention flagged until they finally showed up as speckled patterns derived from rocks. They missed the vibrant punch of Goot's work last year, and by the end there was a sense that the collection could have been condensed by a third and still have got its message across. I like a lot of these peices on their own but as a collection it feels...depressing? And not young and fresh enough. 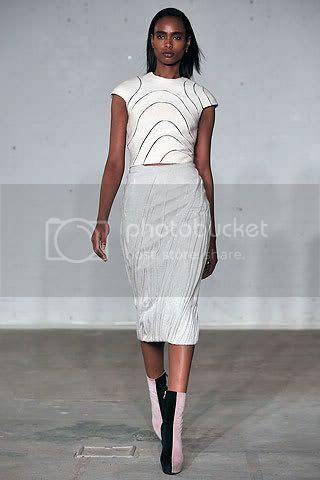 nice 90's minimalist aesthetic with some punchy prints thrown in... some nice pieces, but the idea behind some of the bw colorblocked pieces remind me of gareth pughs last season. my favorite are all the looks on elsa sylvan. 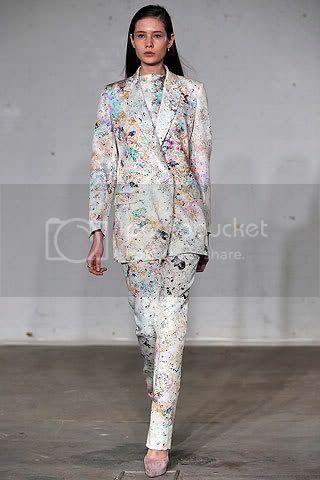 I like this but its very reminiscent of Helmut Lang and the paint-splattered Dolce&Gabbana pieces. Why did he move from New York to London anyway? though the last 7 pieces are pretty gross I really love the rest of it. 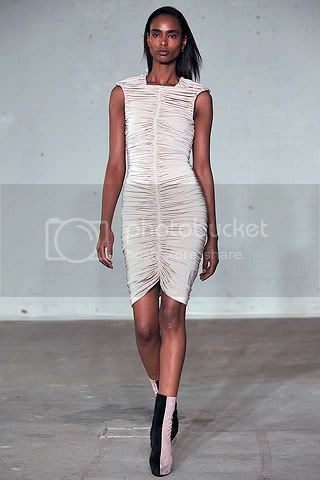 Beautiful play on colors ( well...neutrals ) and I really love how simple it is. London is really interesting and modern this season. Yeah it seems he is getting more buzz now. 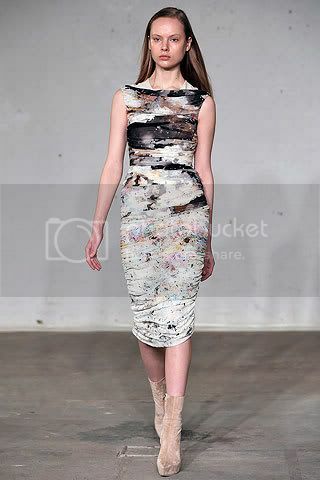 I don't feel anything for the first half of the collection but the latter is wonderful. I'm really enjoying this geology influence that seems to be popping up everywhere. didn't he show in new york? 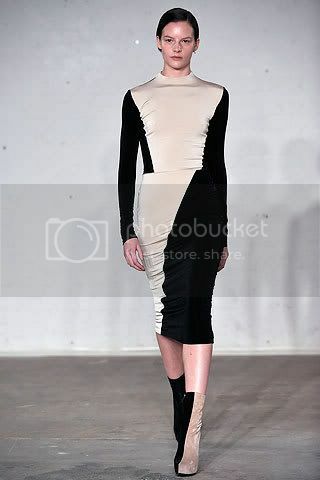 very calm, my fav in LFW so far.